The old Jameson whiskey distillery is a beautiful and historic building in the heart of Dublin. It’s undergone numerous changes in its long life, the most recent of which has seen the building transformed into a spacious venue for distillery tours and events. The distillery was originally built in 1780, and was one of only a few distilleries in Dublin. Uncertain times fell upon the Irish whiskey industry following prohibition in the United States from 1920 to 1933, followed by a trade war with Britain later in the 1930s. It was also during this period that, like so many large buildings in Dublin’s city centre, the distillery was used as a base for rebels during the fight for independence. The decline of Irish whiskey helped Scotch and bourbon to become global favourites. In fact, by the middle of the twentieth century, Irish whiskey was almost dead in the water. Brutal, but effective. The distillery was one of the last to survive in Dublin, eventually closing its doors in 1971, when distilling operations moved to Midleton in Cork. For almost three decades the Bow Street distillery lay vacant, finally reopening in 1997 as a visitors’ centre. 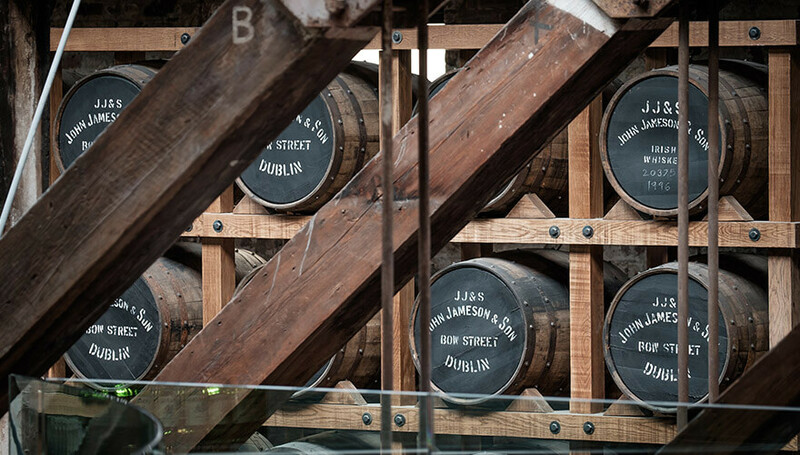 Jameson’s distillery in Midleton became the perfect location for perfecting the unique flavour of Irish whiskey, allowing it to carve out a niche for itself around the world as an alternative to Scotch and bourbon. Since the reopening in the 90s, the Bow Street distillery has undergone three refurbishments. These have generally been completed to update the building and accommodate more visitors, of which there have been four million so far. But it’s the latest refurbishment that is the most interesting. 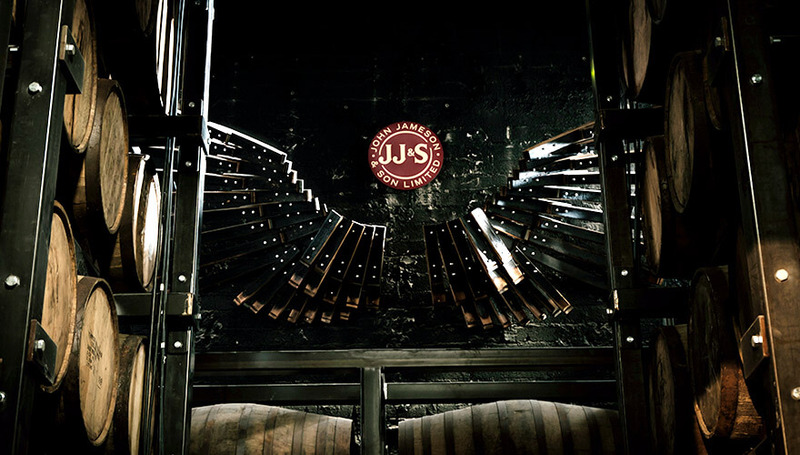 Bow Street is now the Jameson brand home with a maturation house. It remains very much true to the original structure; thankfully, most of the building survived the years of neglect. There’s also a giant old millstone that was used in the original distillery. The project team worked closely with conservation architects during the renovations in order to preserve as much of the old building as possible. And walking around, you see the fruits of that labour. You really get a sense of the old building, despite a number of newly installed features – and the fact that the original copper stills were sold off long ago. In a secretive room behind the maturation house lies a beautiful old desk, equipped with an ancient typewriter and an original leather-bound notebook of John Jameson; his handwriting was very elegant. They call this part of the distillery JJ’s Office. “We’re not entirely sure what we’ll do with this section,” Paula says. “It’s a beautiful space, filled with a lot of artefacts, and the room has been preserved really well.” She suggests it may be used for private, small functions. But as of yet, it is a room of secrecy and beauty. The distillery will now host whiskey tastings and mixology classes, as well as interactive tours. More and more original artefacts are being discovered in Midleton and brought up to Bow Street for display, making it a museum as much as a distillery. The excellently preserved and tastefully renovated building is a site of real interest to anyone intrigued by whiskey, as well as one of historical relevance in Dublin’s ongoing narrative. Patrick studied English, Media and Cultural Studies and now works as a freelance journalist. He writes about social and cultural issues, football and a bit of technology, as well as some fiction. He's confused by the world but finds solace in the smooth rhythms of Marvin Gaye. Ten of Dublin’s most eminent statues have been given a new lease of life – and a voice - thanks to a project called Talking Statues by Failte Ireland with support from Sing London and Dublin City Council. Dublin is a city with a rich past. Its history is full of humour, folklore and, most of all, characters - many of whom have been immortalised as statues. James Joyce They stand in parks, on street corners and in galleries. They connect us to a time gone by, and they all have a story to tell. But when was the last time you stopped to look at a statue? Or gave a moment's thought to who it portrays and why it's there? Talking Statues helps us to remember the achievements and ideas of the people who were turned into stone or bronze. It keeps their stories alive using an artfully crafted monologue delivered directly to your phone. Just scan a QR code near the statue, and James Joyce or even Cúchulainn will give you a bell. I can assure you that it takes communing with a statue to a whole new level.